The national immigration debate that increased in connection with the numbers of immigrants arriving in Germany and reached its climax in summer 2015 has since dominated German newspapers and politics. A diachronic investigation of the greatest German immigration debates seems highly relevant as it can reveal possible changes in the public discourse on immigration. Moreover, social networks might give rise to further changes in the nature of the immigration debate. It appears that with immigration being and having always been the subject of heated debates, the immigration discourse offers the possibility of investigating the strong connection between language and politics like few other topics. 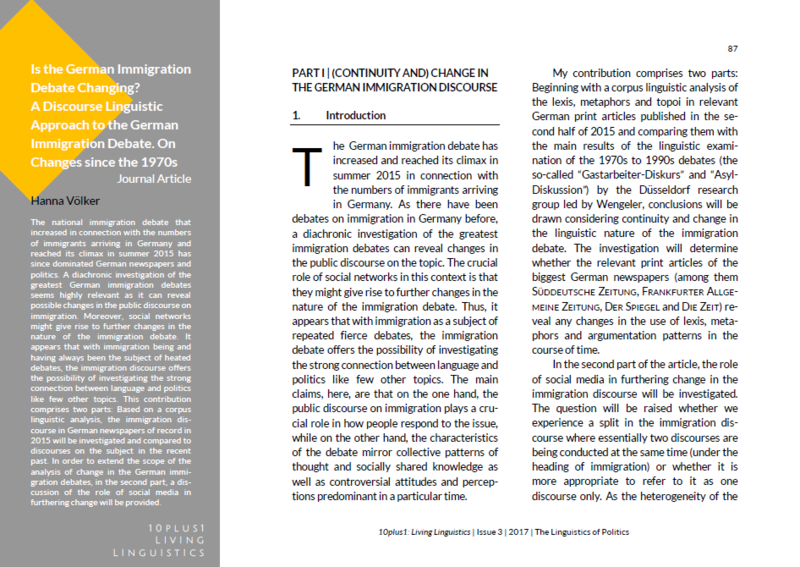 This contribution comprises two parts: Based on a corpus linguistic analysis, the immigration dis-course in German newspapers of record in 2015 will be investigated and compared to discourses on the subject in the recent past. In order to extend the scope of the analysis of change in the German immi-gration debates, in the second part, a dis-cussion of the role of social media in furthering change will be provided. Hanna Völker studied gymnasiales Lehramt (subjects: German and English) at the universities of Marburg, Germany and Southampton, UK. She received an additional qualification for teaching German as a Foreign Language from Marburg University in 2017. Currently, she teaches as a DAAD language assistant at University College Cork, Ireland. Her research interests include pragmatics, especially the linguistics of politics, discourse linguistics, media linguistics and psycholinguistics.